Nationally recognized for his reputation in DUI defense and criminal defense, attorney Jay Tiftickjian has authored and served as editor for a number of important books related to current law and legal developments. From the publisher: For even the most seasoned attorney admitted to practice in the State of Colorado, defending DUI cases has always presented special challenges. Today mounting a successful defense is more difficult than ever. Now you have the advantage with Colorado DUI Defense: The Law and Practice, Second Edition. This text and supplementary DVD contains the most important information to help you attain a successful verdict. The Law and Practice, Second Edition ensures that you understand the chemical, biological and technological concepts and issues underlying DUI prosecution and defense in the State of Colorado. 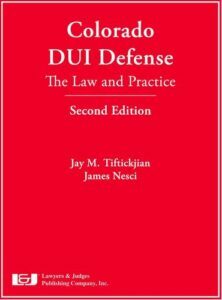 The authors provide the most up-to-date information available on key areas of DUI law in Colorado including: DUI Investigations, Driving and Field Sobriety Testing, Drug Recognition, Evaluation and Chemical Testing, Blood Alcohol Calculations, Pre-trial Investigations and Motions, Practice, Plea Offers and Agreements, DUI Trial Procedures, and more. Colorado DUI Defense is available at Lawyers and Judges Publishing Company and on Amazon. Chapter 10: Are THC Concentrations Appropriate For Presuming Psychomotor Impairment? 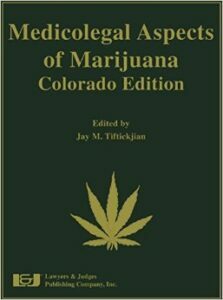 Medicolegal Aspects of Marijuana: Colorado Edition is available from Amazon and Lawyers and Judges Publishing Company. 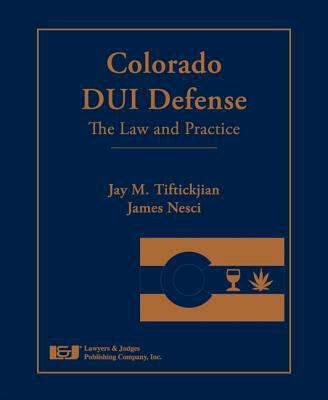 About the book: Jay Tiftickjian was asked to be the editor for the first volume of the Colorado Criminal Defense Bar’s DUI Defense Manual, and he also wrote chapters in it about closing arguments and sentencing, and co-authored a chapter on professional consequences with attorney Abe Hutt. 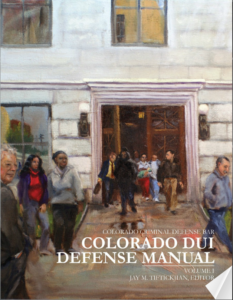 Colorado Criminal Defense Bar DUI Defense Manual is available from the Colorado Criminal Defense Bar. From the publisher: Written by a nationally renowned Denver DUI attorney, Understanding Changes to Colorado’s DUI Laws helps anyone facing a DUI charge in Colorado, even those with prior arrests. The author breaks down each part of the criminal court and DMV process, and covers all aspects of a Colorado DUI case, from the initial police contact and arrest through the trial and even sentencing. 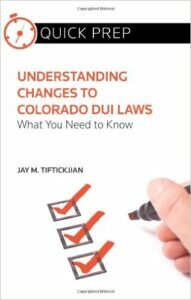 Understanding Changes to Colorado DUI Laws is available from Amazon. From the publisher: For even the most seasoned attorney admitted to practice in the State of Colorado, defending DUI cases has always presented special challenges. Today mounting a successful defense is more difficult than ever. Now you have the advantage with Colorado DUI Defense: The Law and Practice. This text and supplementary DVD contains the most important information to help you attain a successful verdict. Colorado DUI Defense is available at Lawyers and Judges Publishing Company, Amazon and Barnes & Noble. From the publisher: This easy-to-read guide prepares you for both your court case and your DMV hearing from the very start, and addresses issues you might not have otherwise considered. You will be informed and educated after reading this book, prepared to move forward with the confidence that you can achieve the best possible outcome. The Roads Less Traveled: Four Uncommon Defenses to Vehicular Homicide Cases,” Defending DUI Vehicular Homicide Cases, 2014 ed., 71-90. Aspatore Books from Thomson Reuters Westlaw. “There Will Be Blood: A History and Analysis of Forced Blood Draws After Missouri v. McNeely,” The Legality of Search and Seizure in DUI Cases, 2013 ed., 7-38. Aspatore Books from Thomson Reuters Westlaw. “Unraveling the Confrontation Clause: Expert Testimony and Forensic Reports After Williams V. Illinois,” Utilizing Forensic Science in Criminal Cases, 2014 ed., 27-58. Aspatore Books from Thomson Reuters Westlaw. “Understanding The Government’s Playbook: How Systemic Toxicology Laboratory Failures are Spun,” Utilizing Forensic Science in Criminal Cases, 2014 ed., 123-144. Aspatore Books from Thomson Reuters Westlaw. “Four Strategies For Criminal Jury Selection That Do Not Involve Candles, Magic Powders, or Other Voodoo Supplies,” Jury Selection in Criminal Cases, 2013 ed., 81-98. Aspatore Books from Thomson Reuters Westlaw. “Your First Response is Critical: How to Start off Strong in a Vehicular Homicide Defense.” Defending DUI Vehicular Homicide Cases, 2013 ed., 63–76. Aspatore Books from Thomson Reuters Westlaw. “Analyzing the Profits and Perils of Drug Court as an Option.” Defense Strategies for Drug Crimes, 2013 ed., 53–65. Aspatore Books from Thomson Reuters Westlaw. “Planting the Seeds for a Successful Defense in a Drugged Driving Case.” Navigating DUI Drug Cases, 63–81. Aspatore Books from Thomson Reuters Westlaw. “Preparing for Trial: Getting Organized and Getting Your Client’s Story.” Trends in DUI Discovery, 2012 ed., 99–117. Aspatore Books from Thomson Reuters Westlaw.